Science Fiction Geeks - Scifi News: Admiral Ackbar as a University Mascot? It's a trap! 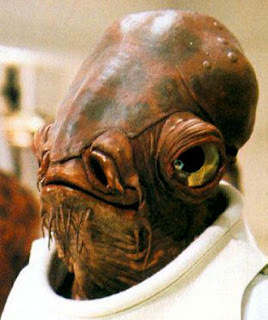 Admiral Ackbar as a University Mascot? It's a trap! According to Zap2It, students at the University of Mississippi (Ole Miss) are considering making Star Wars' Admiral Ackbar their new mascot. The school wants the rebel leader from Return of the Jedi to replace Colonel Reb, a controversial figure, who was retired in 2003. The student mascot committee will get the final vote, but George Lucas would also have to sign on to the idea as well, or somebody's gonna sue. Coolest mascot ever? I think so. Hahaa. Excellent news. Hope Lucas goes for it.